Standing in line to vote on Tuesday here in DC (took me about and hour and a half, DC went 93% for Obama) I noticed the woman in front of me reading one of my favorite books. Thad Carhart’s The Piano Shop on the Left Bank. 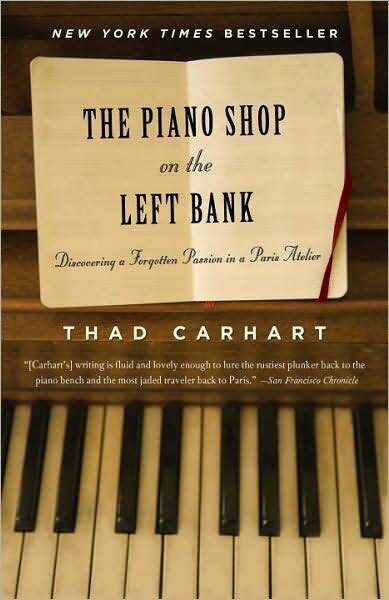 This memoir tells the story of Carhart’s life in Paris and his quest for the used piano that would be perfect for him. As he tells the story of an invitation-only piano shop he also gives a bit of a history of the piano and piano manufacturing. Although I am not much of a fan of non-fiction–I feel like I got enough of that in college and graduate school–this book is the perfect combination of Paris, music, gossipy details, and a nod to a more interesting, more romantic past. One of the more fascinating things described in the book is the diversity of piano manufacturers that used to exist when home pianos were as commonplace as TVs (at least among those who could afford them). Carhart also describes how manufacture differed from country to country and company to company, evident in design, finish, size, and sound. Since reading the book, I can’t pass a piano without checking it out to see who made it. Of course the usual suspects show up a lot (Steinway, Yamaha, etc.). But I am also amazed at the variety of names I have come across. The dustier the piano the more likely it is to be some long-forgotten manufacturer. I love to think about the history of these instruments. Who made it, where it came from, where it lived through the years, who has played it. I love the variety in the same way I love regional differences in language, food, customs, aesthetic sensibilities, etc. There are certainly still industries that buck the trend—or at least support a dual track with mass market on one rail and niche market on the other. Wine production comes readily to mind. In addition to the big guys that you find everywhere, there are so many smaller wineries that you never seem to see more than once or in more than one restaurant or shop unless you really try and hunt them down. Perhaps this is what makes a trip to Napa or Chianti or the Yarra Valley so fabulous. 1. Diversity is good (pianos, wine, Presidential candidates, etc.). 3. (Red) Wine is good (special shout out to New World Pinot Noir). 4. I like to read. 5. I like to live in the past. 6. I don’t always know how to end my blogposts. “I love to think about the history of these instruments. Who made it, where it came from, where it lived through the years, who has played it…”– Same reasons I love living in an old neighborhood (among other reasons).I seem to remember that Dayton’s was always Dayton Hudson, but my memory is sketchy. I have it in my head that Hudson comes from the Hudson’s Bay company, which in Quebec is now “La Baie”, or at least was 15 years ago. Maybe it is Macy’s now, too.I could easily verify that with a little quick research online I suppose. Juliebean:Dayton’s and Hudson’s came together in 1969. But, now that I think of it, the stores were never branded Dayton-Hudsun were they? They had the same parent company but I think they kept their distinct names (even though some of their in-house product lines were shared and co-branded). Ernie – The book is not coming along. I kind of decided I probably wouldn’t want to read it so why bother. The material I had in my head wasn’t as interesting as I thought. I will be updating my 40 by 40 list soon. Priorities have definitely changed.